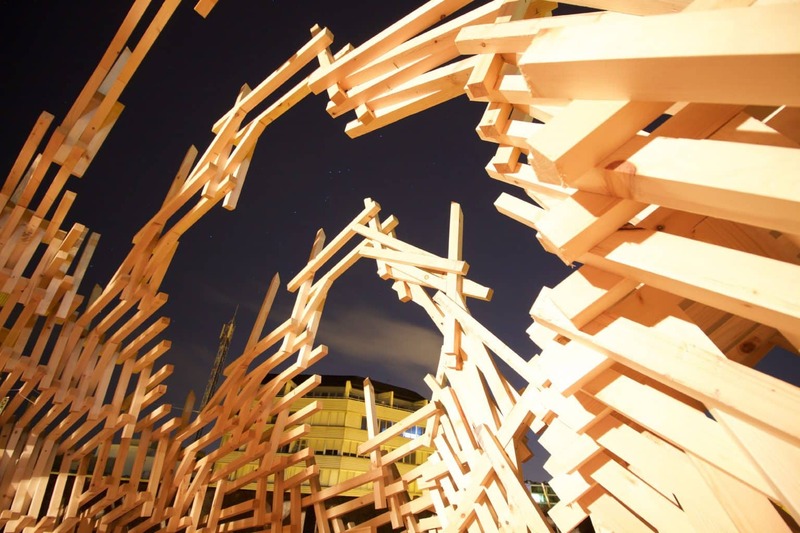 Digital Urban Orchard is a research project of the Institute for Advanced Architecture of Catalonia, realized as part of the Open Thesis Fabrication 2015/16. 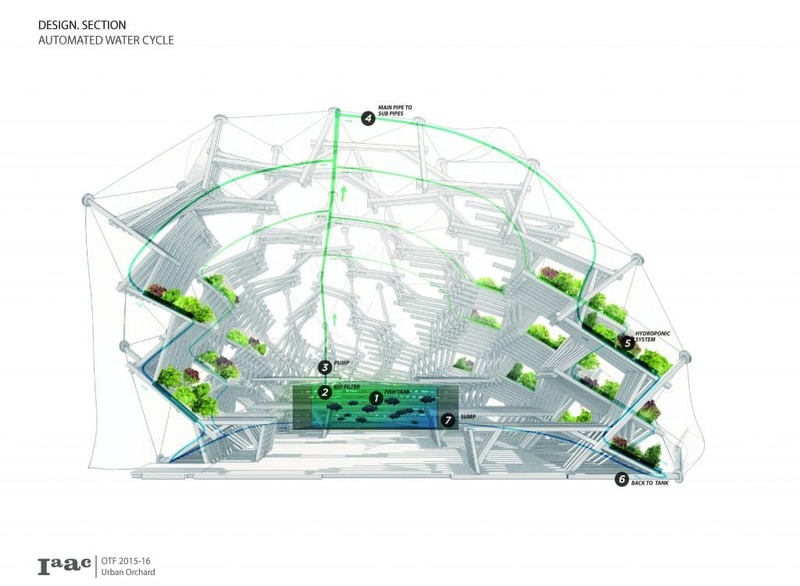 The pavilion is the prototype of a new form of urban agriculture based on aquaponics: a symbiotic system where breeding fishes is combined with the soilless cultivation of plants and vegetables. 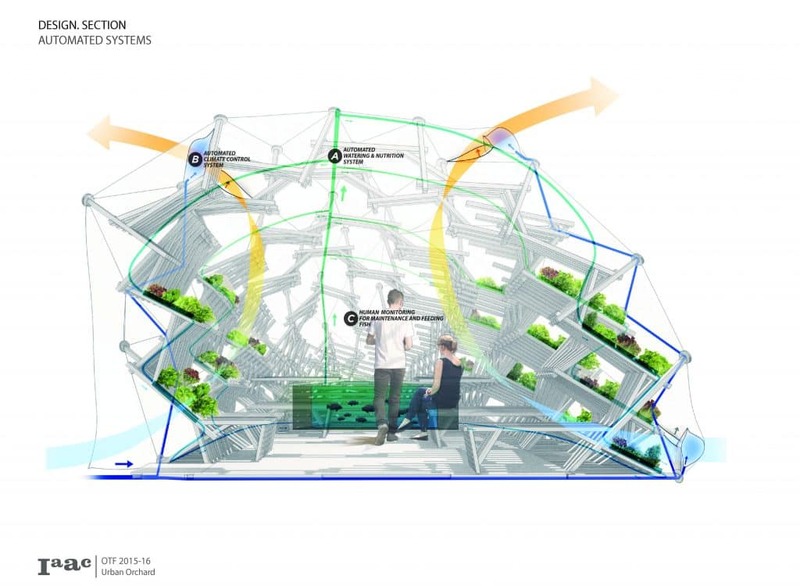 The pavilion demonstrates a concept in which soilless aquaponic system could be cultivated over building roofs as a habitable space in itself by growing the plants on top of the structure. Compared to traditional green houses, the plantation area increased tremendously by using the surface area of the structure and the production rate increased manifold by introducing aquaponic system. Water is distributed to the all parts of pavilion consuming little energy as gravitational forces assist the designed slopes to naturally distribute the water to all parts of the structure. 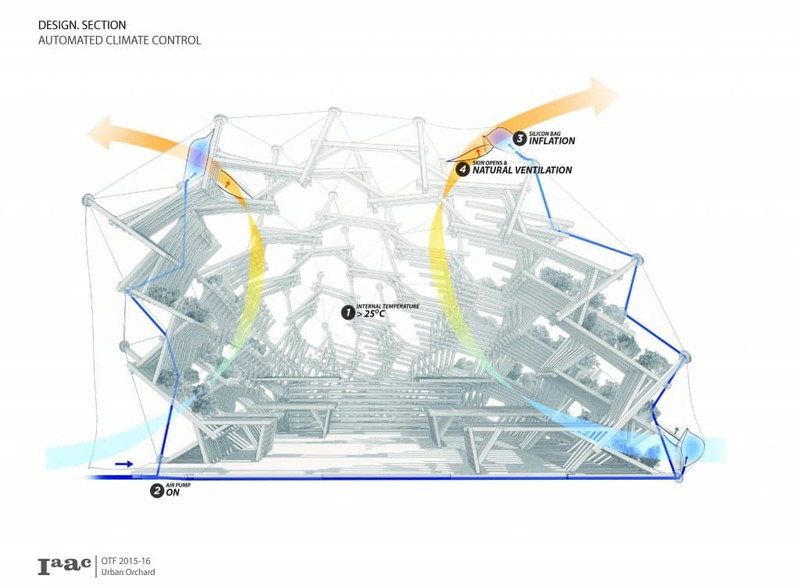 Connection to an overhead water tank in building can transform this into a almost zero energy concept. This system could be implemented as a whole or as independent self contained module. 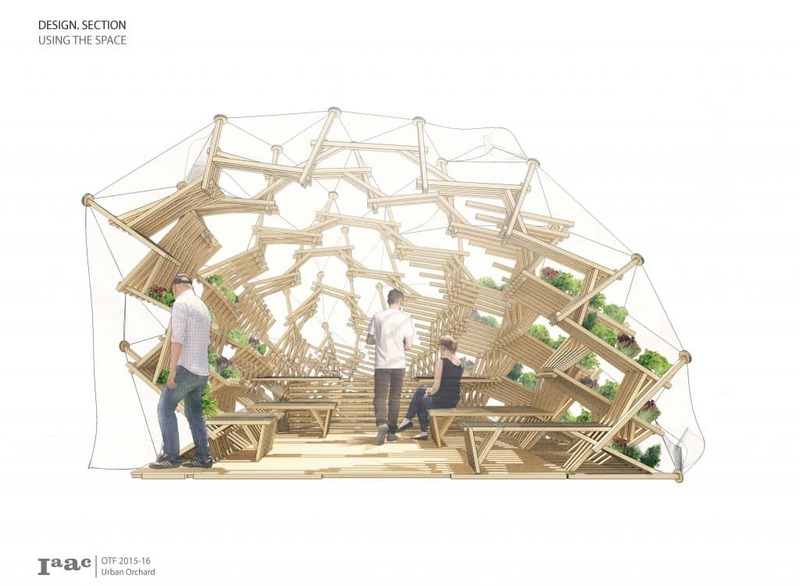 The design of the pavilion has been optimized in order to maximize the solar exposition of the plants, both on the surface and on the interior of the pavilion. 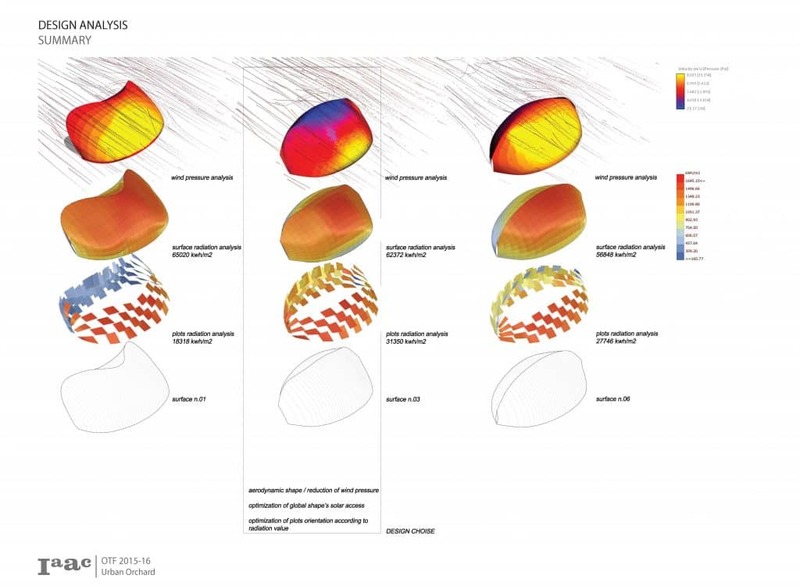 The form has been developed following wind and solar analysis. 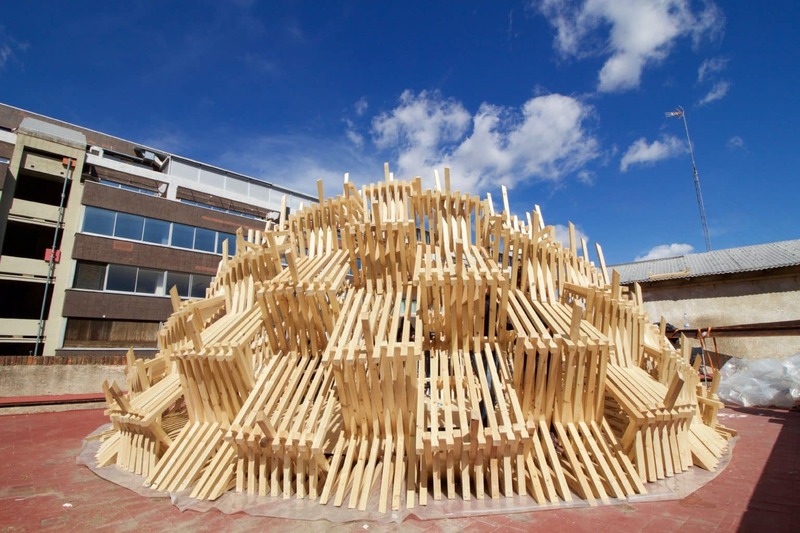 The design of the wooden structure allows the mounting of the aquaponic systems allowing the flow of water along the flow of lines in the structure. 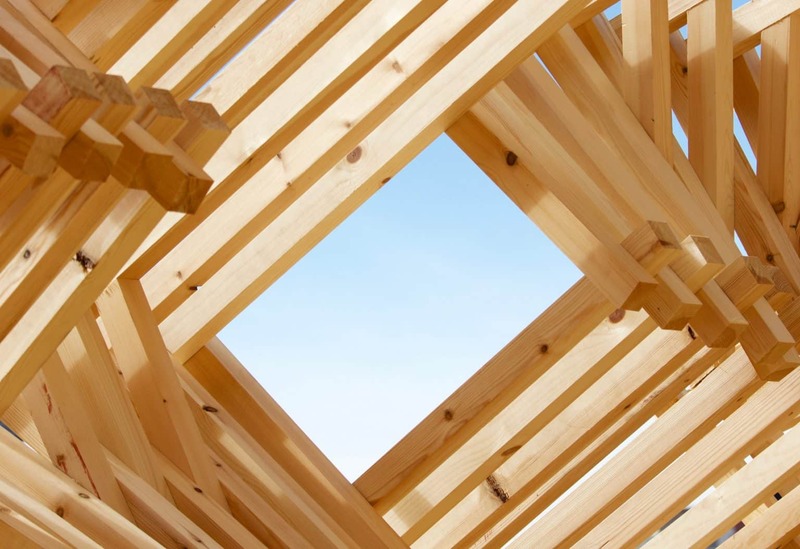 The facets of the wooden structure are designed to capture the ideal solar radiation suited for winters and also summers. 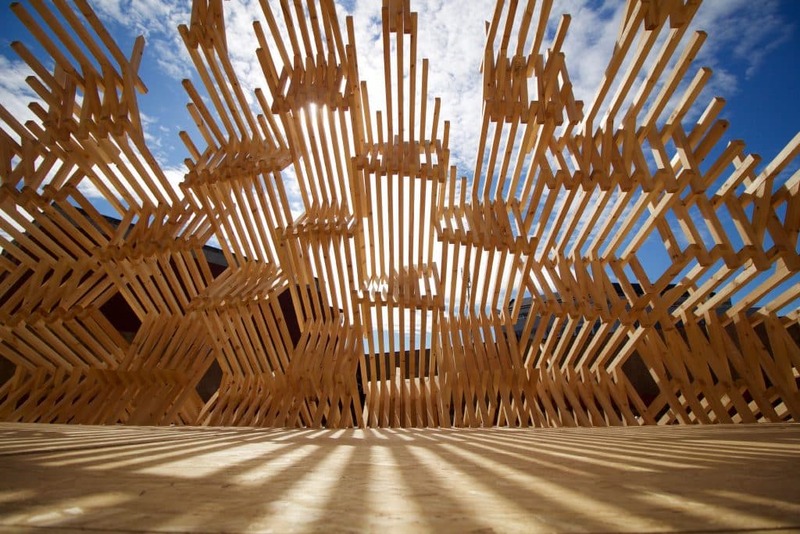 Play of shadows through the wooden structure avoids the excess radiation onto the plants during summers. Scattered wooden members on the top of the pavilion allow solar radiation to evenly reach the plants grown on the pavilion. 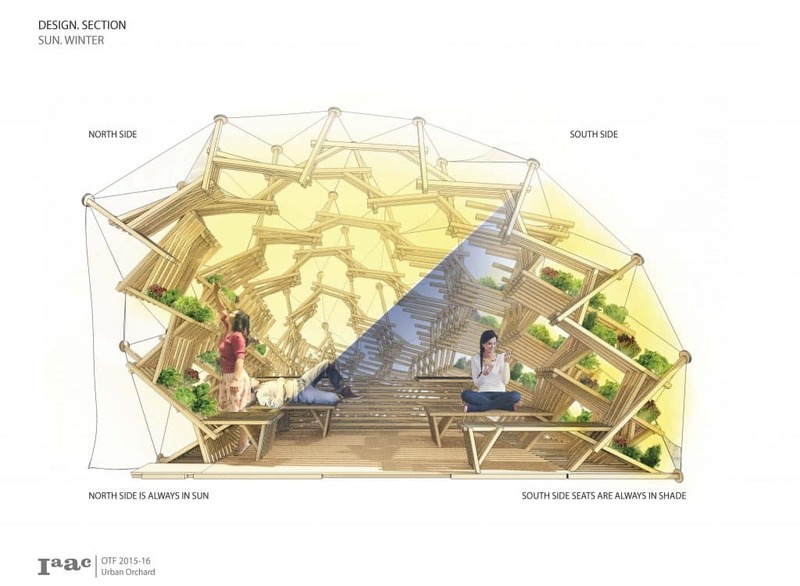 The pavilion is divided into three major components: aquaponic system, silicon skin and wooden structure. Each perform a primary function and form the frame work for the other component to function. 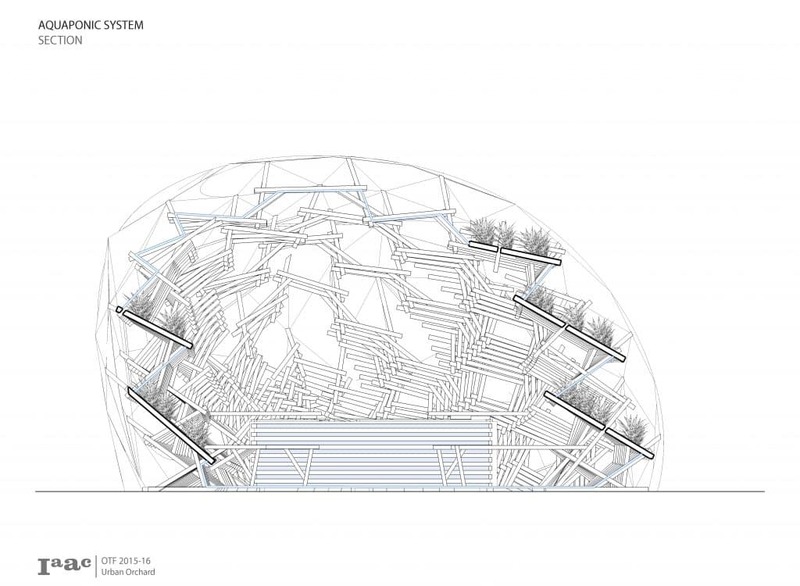 The realization of the Digital Urban Orchard involved computational methods and robotic fabrication tools. Hence the implementation of a 1:1 scale prototype allowing to test techniques and materials on real scale. 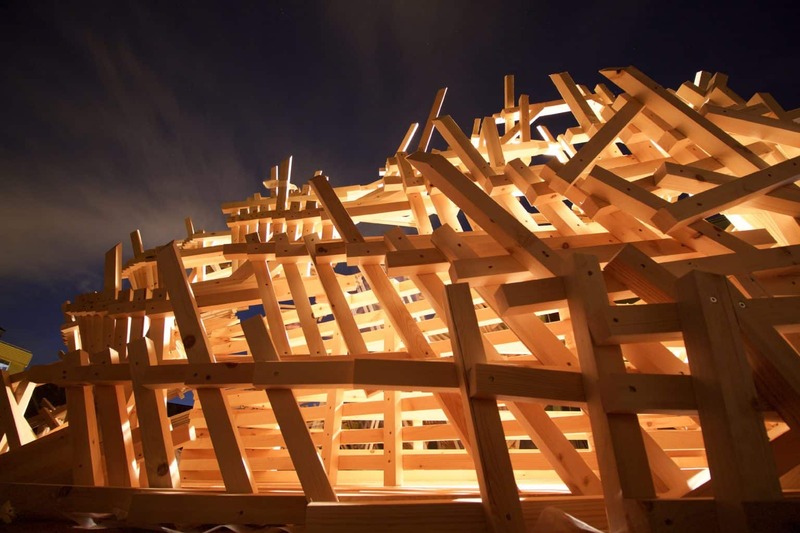 The resulting form was manageable to fabricate, realized using sticks of Redwood of Flanders (45×45 mm). 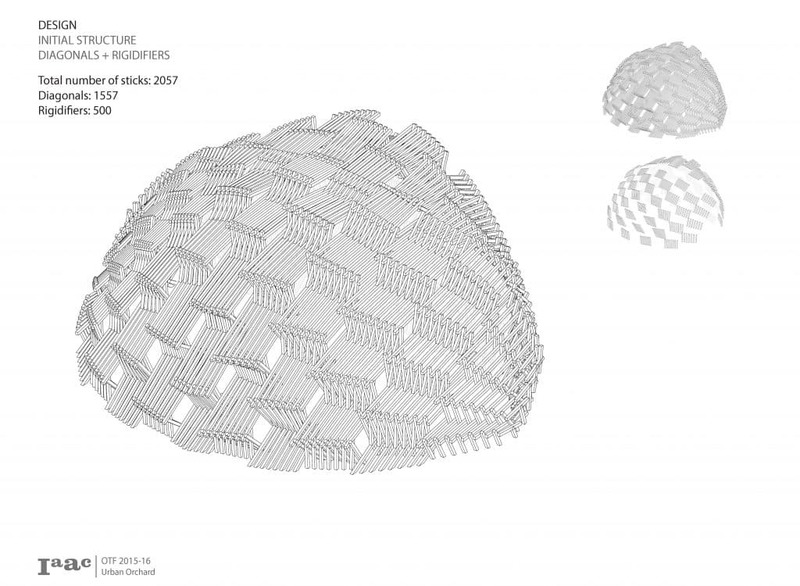 The Pavilion’s design combines solar/wind shape optimization, structural logics, the robotic fabrication constraints together with the in-situ manual assembly. This last step splits the structure in 12 different bow-shaped sections: they are pulled together and manually screwed in position. 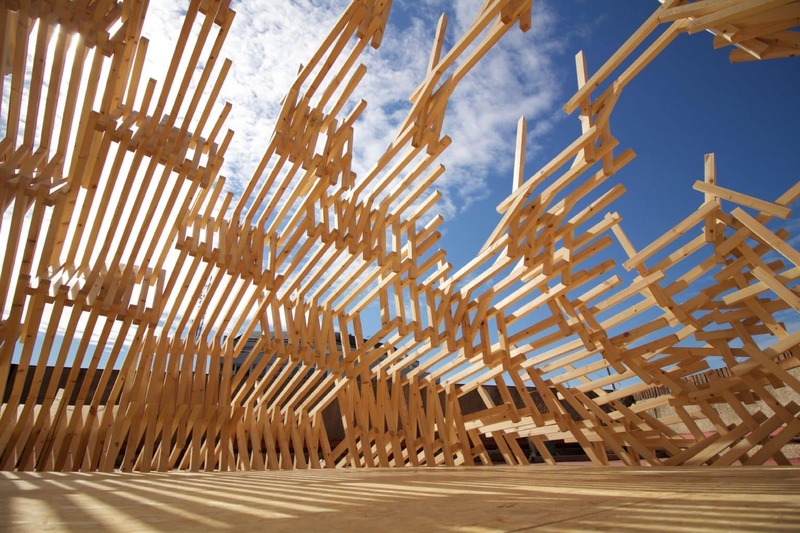 This cocoon-shape hidden in between a misleading undifferentiated amount of wooden slats manifold structural purposes and functional ones. 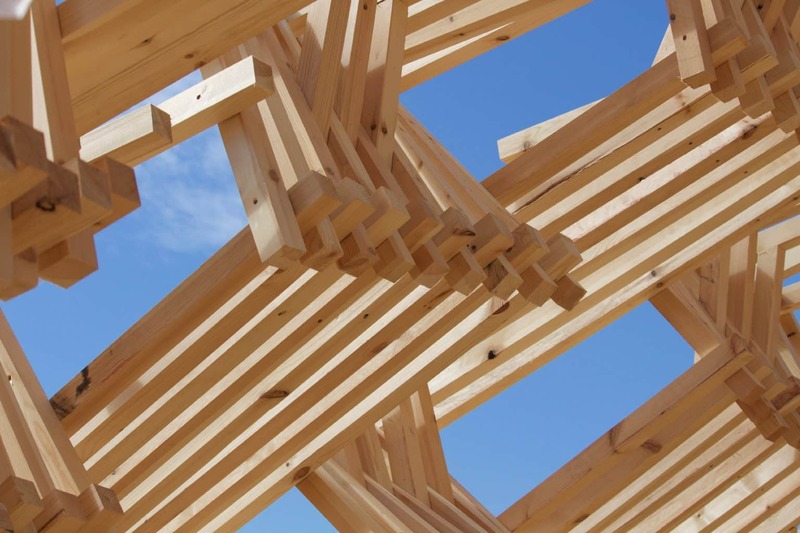 The sticks are distinguished in main trusses, structural stiffeners, plants supports, skin holders, furniture supports and platform beams. 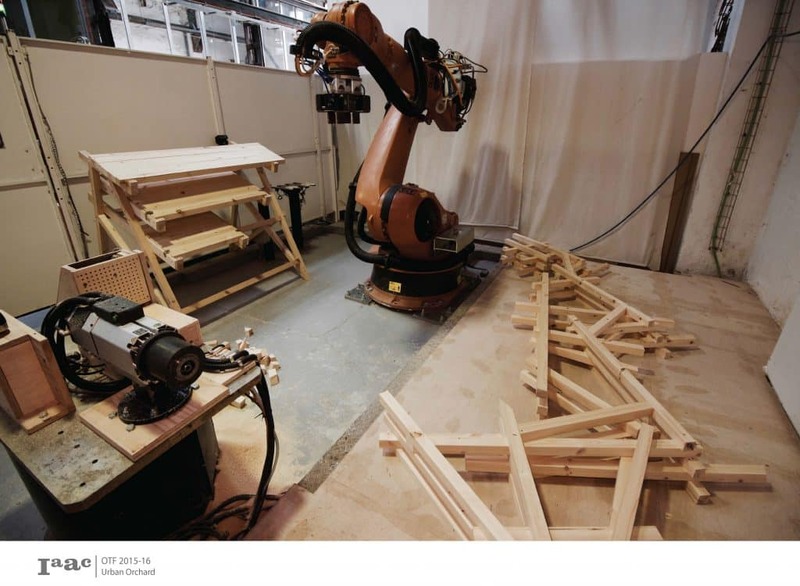 In the light of the previous experience of the Fusta Robòtica Pavilion 2015, the IAAC researchers improved the final robotic manufacturing process and they succeed to optimize the production process, mainly reducing the scrap’s length, using the most part of the material. 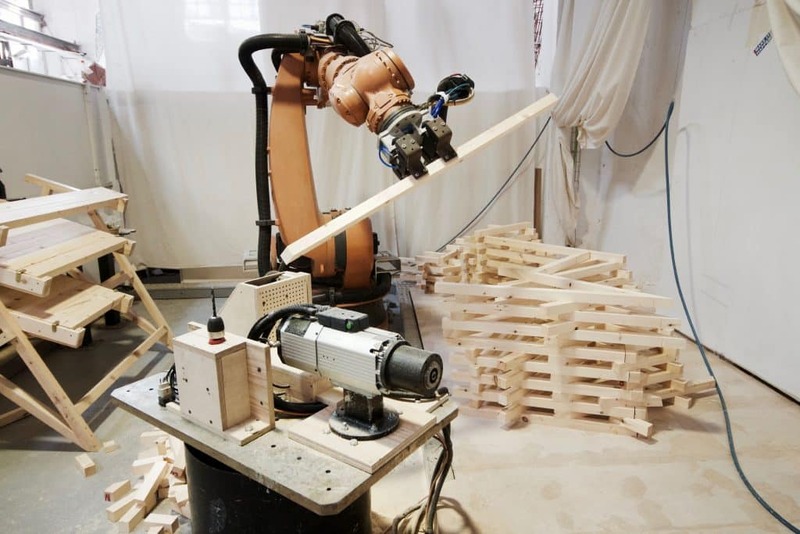 Each wooden stick is handled throughout one single robotic fabrication loop: picking, cutting and dropping. According to the respective final sticks positions and functions, they are selected from one out of the three starting sticks, provided by the custom made wood-feeder. They are then cut in various and always different lengths and their end edges are shaped with different 3-dimensional angled cuts. 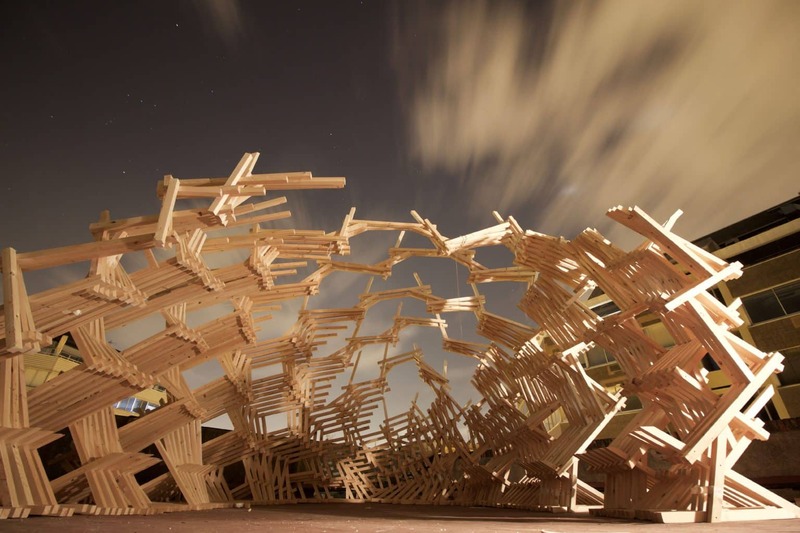 Thus each stick, varying each time the fabrication loop, informs the robotic fabrication code. 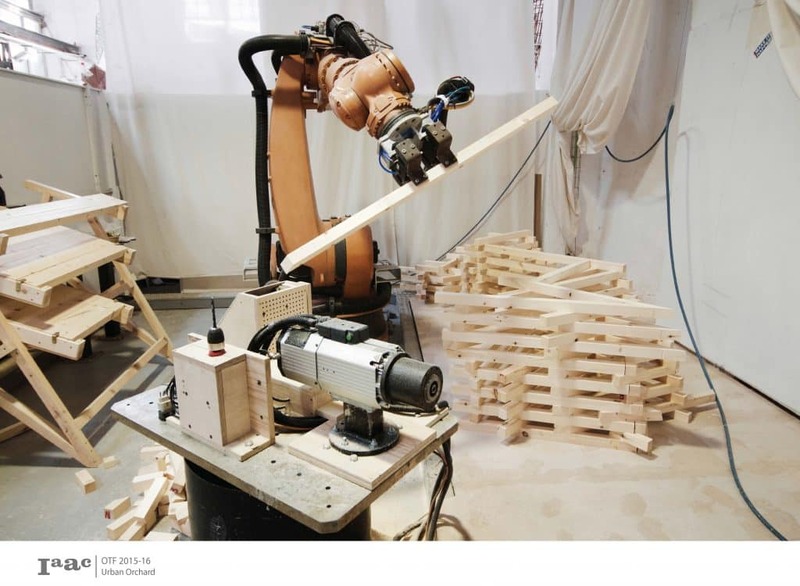 The first phase of construction consisted in the robotic fabrication of the structure out of 1680 sticks of wood during 60 hours of robotic fabrication. 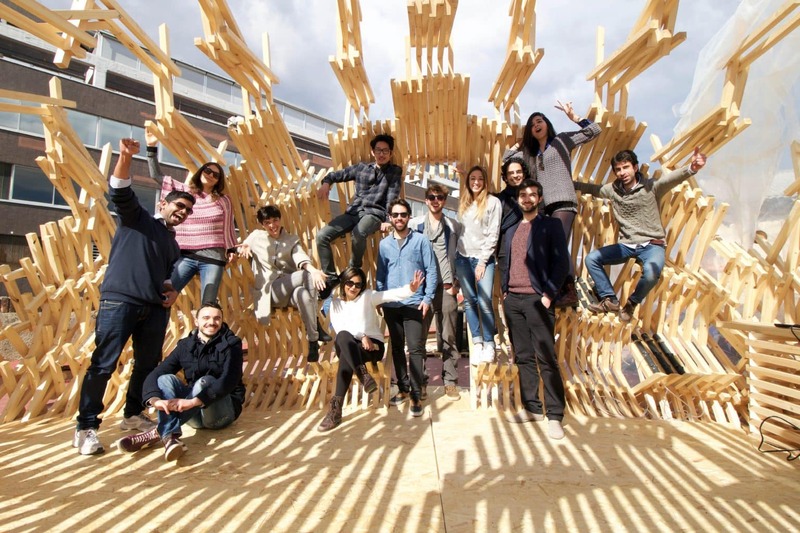 The fabrication protocol of this pavilion is a developed on the previous OTF Pavilion Fusta Robotica. 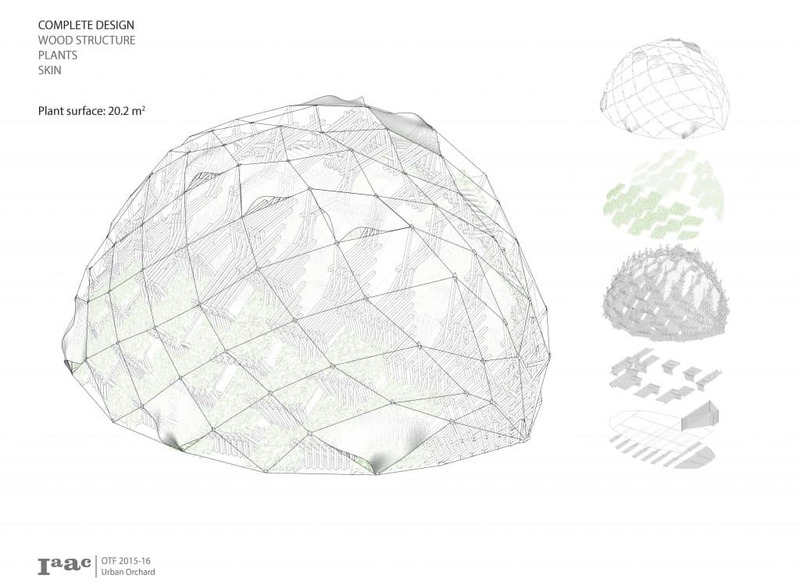 During the following phases of the construction, the pavilion will be complemented by a transparent protective skin self responding to the internal and external environmental conditions and the integration of the farming products with plants and fishes. This membrane on top of the wooden structure controls the ventilation air inside the pavilion. Sensors with the help of arduino control the temperature and humidity by initiating the active inflation and deflation mechanism in the skin to maintain optimum temperature needed for the growth of the plants on the pavilion. 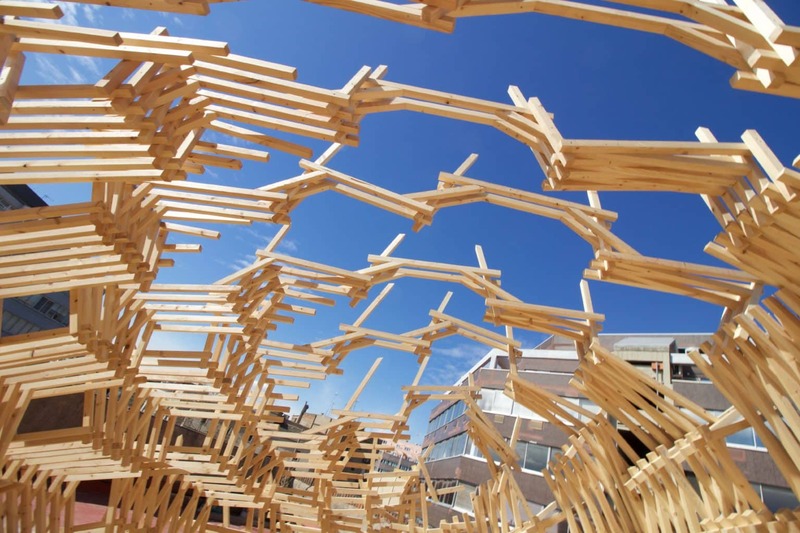 A simple network of pipes mounted on the wooden structure allows the plants to grow. 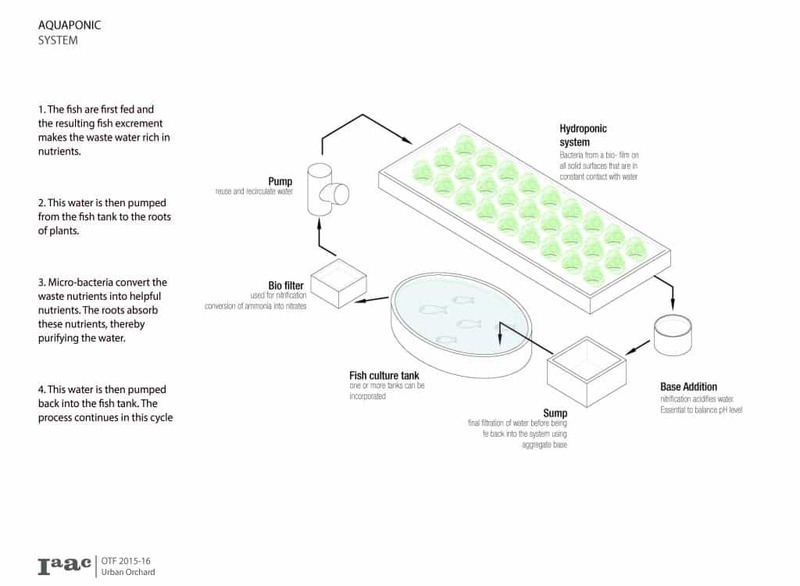 Water from the aquaculture system in the fish tank is fed to the hydroponic system mounted on the structure, where the by-products are broken down by nitrification bacteria into nitrates and nitrites, which are utilized by the plants as nutrients, and the water is then recirculated back to the aquaculture system in the fish tank. Faculty: Areti Markopoulou, Silvia Brandi, Alexandre Dubor, Djordje Stanojevic. Students: Josep Alcover, Angelo Figliola, Yanna Haddad, Ji Won Jun, Monish Kumar, Mohamad Mahdi Najafi, Andrea Quartara, Fathimah Sujna Shakir.